John L. Nelson and Mattie Shaw gave birth to two musicians: Prince and Tyka Nelson. 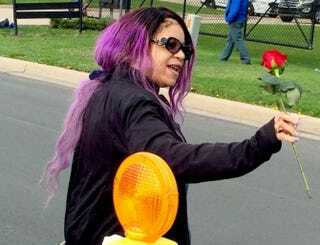 As the stunned world grieved over Prince’s death Thursday, Tyka Nelson emerged from Prince’s Paisley Park compound in Chanhassen, Minn., to thank fans for loving her brother. “He really loved you all,” Tyka said to the crowd. Although Tyka was never in the spotlight herself, she is also an accomplished singer. Her most recent recording, A Brand New Me, was released in 2008. As fans stationed themselves around Paisley Park on Thursday, a rainbow appeared over the vast estate. Something tells me Prince’s presence surrounded everyone there.